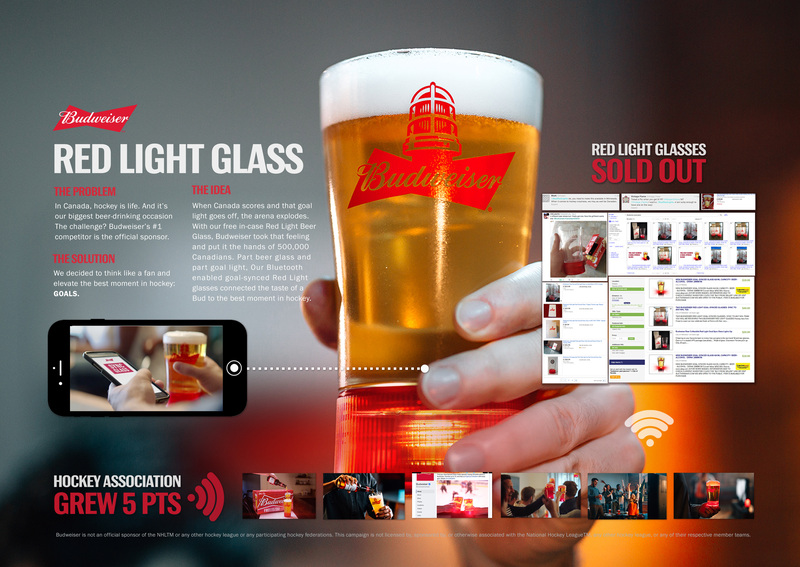 This was backed with a tactical 30-seond spot, social campaign, and PR push as Budweiser toured Canada’s Goal Light around the country, stopping in seven major cities. Fans could sign up on Budweiser.ca to have their names engraved on the light alongside those of hockey heroes Wayne Gretzky, Paul Henderson, and Don Cherry. In the end, the brand engraved more than 20,000 names on the country’s new beacon of goal celebration. Three weeks before fans took to the stands, the team introduced the goal-synced beer glass with a TV spot and social campaign. The goal-synced glass was free in specially marked cases of Budweiser and users could sync it with the Budweiser Red Light app so it would light up every time a goal was scored.